Ever thought about fairytale weddings? Then this is the place to be! We bring you the most gorgeous weddings from across continents, real life experiences of brides, grooms, wedding vendors like caterers, wedding photographers, make-up artists, hair stylists and many more. We post about the latest trends in the wedding industries. 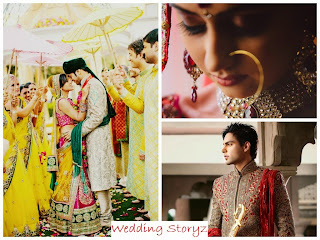 But what sets us apart is that we bring you the story from the vendor's side too and not just from the bride and groom, so that you get an idea, what all goes into the making of the end products like lehengas, sarees, sherwanis, the final bridal look by a make-up artist, photo albums, wedding decor and mandap, cuisines and food arrangement, cocktail bars, salad bars, ice cream stalls, chat counters and the possible things that you will see on your wedding and post your wedding too. In simple words, our blog will help you make better decisions when it comes to weddings.